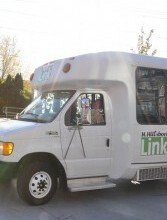 We connect people to transportation options in Clackamas, Multnomah and Washington counties. We believe transportation is a basic human right. 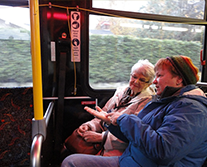 Access to transportation means mobility, and being mobile allows a person to connect with his or her community and other essential life destinations. A simple conversation over the phone allows us to link individuals with the best options for their needs. Our services are offered at no cost to our customers, although donations are gladly accepted. Volunteers are at the heart of our organization and we rely on their contributions to keep the wheels moving. The support of our community is imperative in fulfilling our mission. We have a variety of opportunities for getting more involved with our organization. Join us for Lunch in Motion! Join us at our new fundraising event, Lunch in Motion! Because a person in motion tends to stay in motion. And it all starts with YOU! 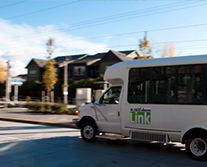 We are excited to announce that as of Monday, Oct. 1, N.Hillsboro Link will be running on a more robust schedule as well as on weekends. Click for the new schedule. 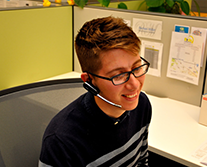 Ride Connection has opportunities to join our wonderful staff helping those within our community. We are currently looking for a Part-time Driver - Hillsboro and a Part-time Driver for Washington County. .